Bethany Covenant Church, 785 Mill Street, Berlin, Ct.
Now in its 20th season, CONCORA’s Summer Festival offers amateur singers an opportunity to rehearse, learn, and perform with CONCORA (Connecticut Choral Artists), the region’s oldest and best-known professional choir. The Festival offers a week of exceptional music-making, uplifting repertoire, and high artistic standards in a relaxed atmosphere with plenty of opportunities for socializing, renewing friendships, and making new friends. In evening and weekend sessions, participants rehearse with Artistic Director Chris Shepard and an ensemble of CONCORA’s professional singers, enjoying several social events during Festival week, which concludes with a public concert before a large and enthusiastic audience. Wonderful Town! A Bernstein Centenary: Marking the centenary of Leonard Bernstein’s birth on August 25, 1918. Our repertoire will include excerpts from his monumental Mass, complemented by wonderful arrangements from several of his Broadway shows, including Wonderful Town, West Side Story, Peter Pan, and Candide. That’s right—no Chichester Psalms! 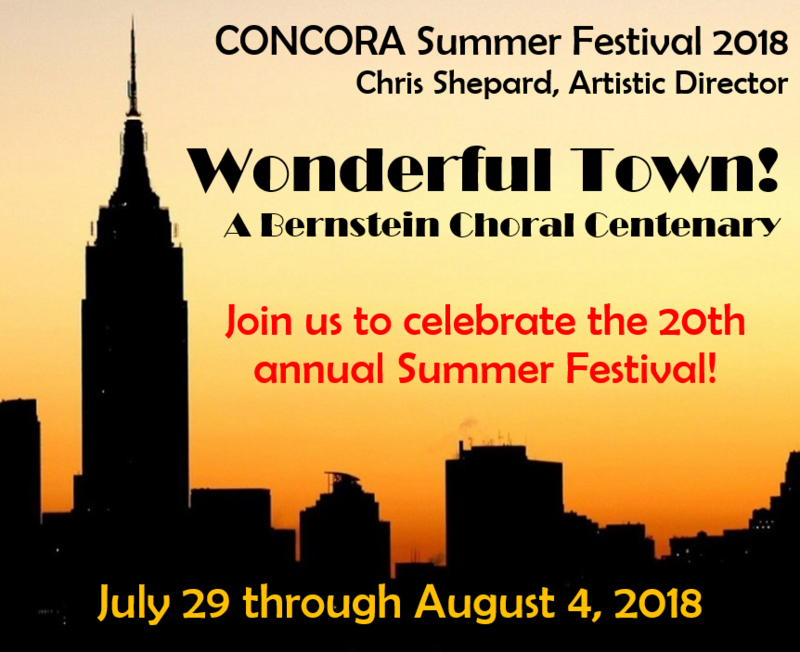 Many of us have performed that music many times (including those who participated in CONCORA’s 2012 Summer Festival), and it will be great fun to give Bernstein’s other choral works an outing. Rehearsals are Sunday afternoon, Monday evening, Wednesday evening, Friday evening, and Saturday morning. The public concert is at 4:00 PM on Saturday, August 4. Festival tuition is $165. CONCORA offers Choral Scholarships to qualified high-school and college-age students. Registration deadline May 20.